Beyond These Dark Lands Are Edges Of Joy: The Author's Reflection on The Poem Titled, My Letter to You, a Poem of Invitation. The Author's Reflection on The Poem Titled, My Letter to You, a Poem of Invitation. The first poem in my book, BEYOND THESE DARK LANDS ARE EDGES OF JOY, is intended as an introduction. In fact, an earlier version of this poem was titled, Introduction. I hoped to use it to set the tone and expectation for the reader. But when one of my reviewers suggested it would confuse the audience to have an introduction in the form of a poem I renamed it "My Letter to You, A Poem of Invitation." I was still committed to the poem and the idea of putting it ahead of the body of the book so I compromised his advice by leaving it in the location of an introduction. This poem begins by describing how I want to write beautiful poetry, "About daisies in the fields, where little lambs sleep and the children laugh..." I admit it is not very deep but I like beautiful poems with vibrant picture words and I would like to write that kind of poem for people to read. 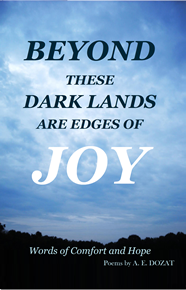 From Beyond These Dark Lands Are Edges Joy. But this poem explains that there are a lot of people who "live lonely lives in cold windswept lands..." I was expressing that this collection of poems is for those people who struggle and have pain. Starting with this poem, I tried to be sensitive to people's lives of hardship and wrote that I won't "Belittle your struggles..." Many books of inspirational poetry are filled with shallow overused platitudes and quaint sayings. I was committed to offering something that was thoughtful, meaningful and with depth. I wanted this book to really encourage people. This first poem bluntly explains my purpose to offer hope. As a person of faith, I believe that God through His Christ is the source of hope. Near the end this poem gives a loving picture of Christ. The last line is my favorite. I won't give it away here (sorry for the teaser) but it pulls everything all together. 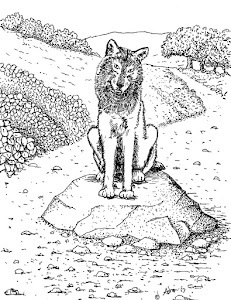 I placed the illustration in a small circle in the lower right corner. 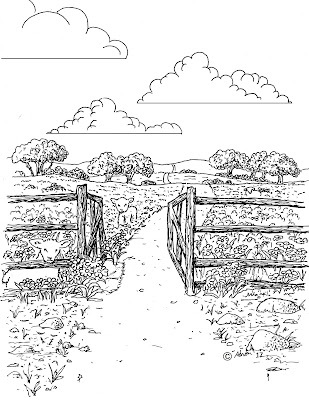 My drawing shows an open gate to symbolize the invitation. 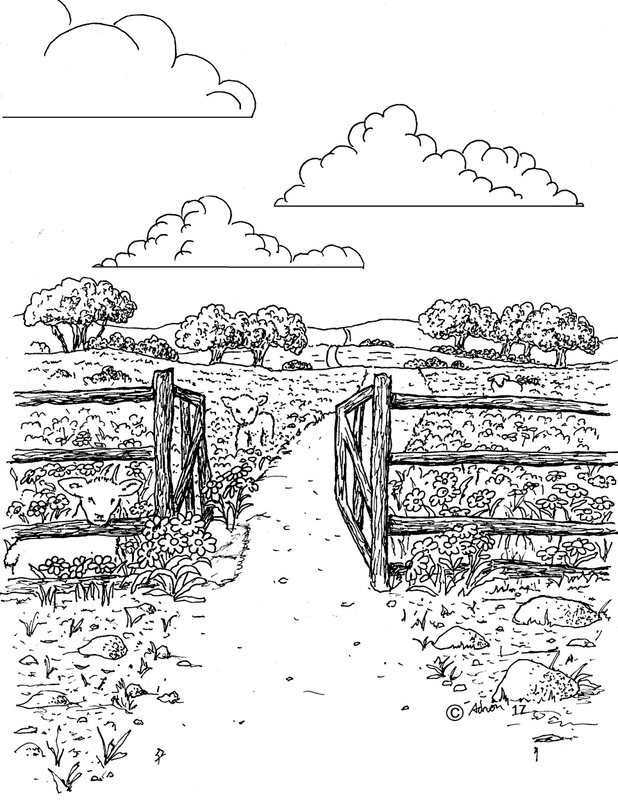 The open gate leads to a sunny field occupied by two sheep. This first poem is an invitation; it invites the reader to come to a bright place where the God of hope waits.